Washington Rock State Park in Green Brook (5 miles from the Middlebrook Encampment) is where George Washington went to monitor British Trooup movements, when General Howe was moving toward Westfield in 1777. Historian, Robert A. Mayers came across an account of another rock observation post along the ridge in a British account written in 1785. This document mentions Washington's observation post as being on a rock on the south side of Middlebrook Heights. 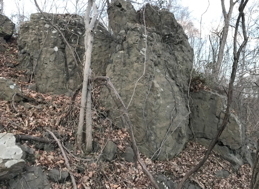 The first range of the Watchung Mountains between Vosseller Avenue and Chimney Rock Road. The area of the Middlebrook Encampment. 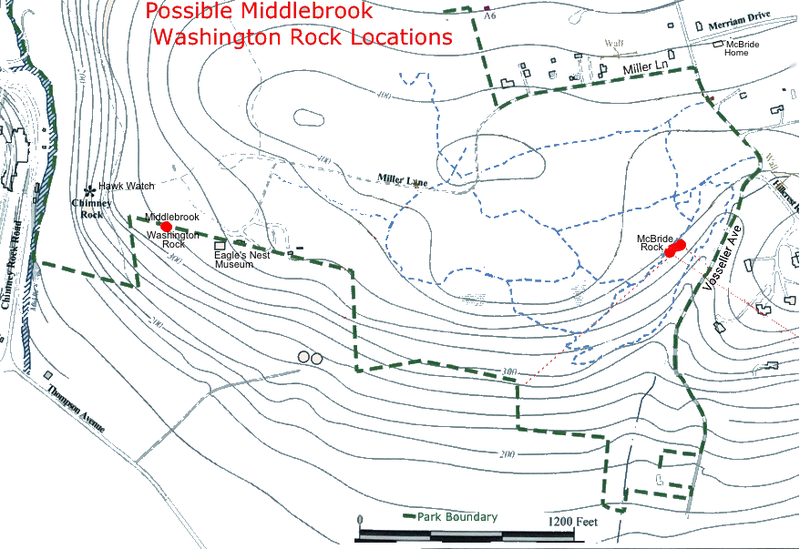 He found several other more recent references to a Middlebrook Washingon Rock, in famous historian Benson Lossing's book, "Pictorial Field-Book of the Revolution". 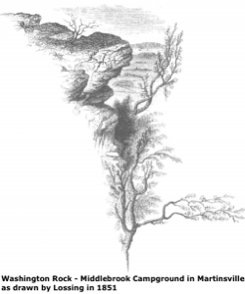 In 1851 Lossing visited New Jersey and inquired about the location of "Washingtonn Rock." 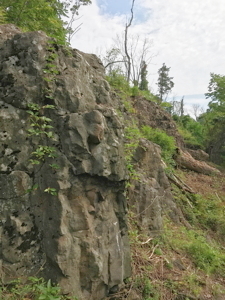 At the time local residents assumed that the Rock was the rocky ledge at Middlebrook Heights. This makes sense since the army was camped at Middlebrook heights in 1777 and for the most part Howe was camped in New Brunswick which is easily visible from Middlebrook Heights. In his new book "Revolutionary New Jersey: Forgotten Towns and Crossroads of the American Revolution"Mayers describes when Washington might have used each of these locations depending on where the action was. These lookouts, at a elevation of between 400 and 500 feet above the central plains of New Jersey, provided the American Army with a unique sight advantage. In The Pictorial Field-Book of the Revolution or, Illustrations, by pen and pencil, of the history, biography, scenery, relics, and traditions of the war for independence. 1859 Lossing says. 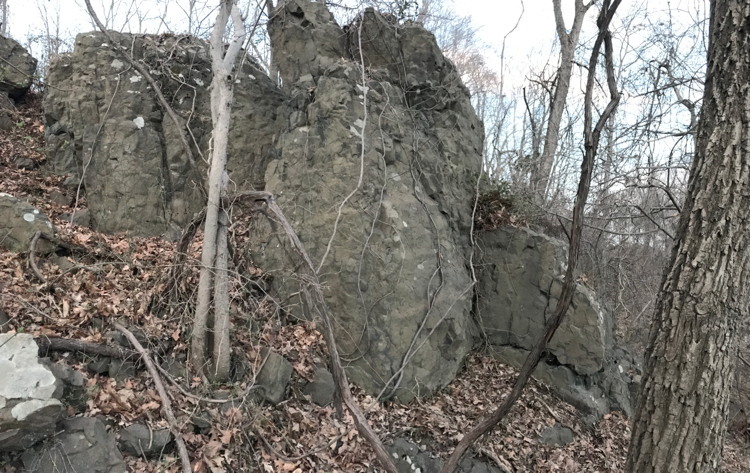 "Returning to the village, we proceeded to visit the camp-ground, which is upon the left of the main road over the mountains to Pluckemin [now Vosseller Ave]; also "Washington's Rock." The former exhibits nothing worthy of particular attention; but the latter, situated upon the highest point of the mountain in the rear of Middlebrook, is a locality, independent of the associations which hallow it, that must ever impress the visitor with pleasant recollections of the view obtained from that lofty observatory. We left our wagon at a point half way up the mountain, and made our way up the steep declivities along the remains of the old road. How loaded wagons were managed in ascending or descending this mountain road is quite inconceivable, for it is a difficult journey for a foot-passenger to make. In many places not even the advantage of a zigzag course along the hill sides was employed, but a line as straight as possible was made up the mountain. Along this difficult way the artillery troops that were stationed at Pluckemin crossed the mountain and over that steep and rugged road heavy cannons were dragged. Having reached the summit we made our way through a narrow and tangled path to the bold rock seen in this picture [drawing to the right). It is at an elevation of nearly four hundred feet above the plain below, and commands a magnificent view of the surrounding country included in the segment of a circle of sixty miles, having its rundle southware. At our feet spread out the beautiful rolling plains like a map, through which course the winding Raritan and the Delaware and Hudson Canal. Little villages and neat farm-houses dotted the picture in every direction. Southward, the spires of New Brunswick shot up above the intervening forests, and on the left, as seen in the picture was spread the expanse of Raritan and Amboy Bays, with many white sails upon the bosoms. Beyond were seen the swelling hills of Staten Island, and the more abrupt heights of Navesink Mountains, at Sandy Hook. Along this lofty rock Washington often stood, with his telescope, and reconnoitered the vicinity. He overlooked his camp at his feet and could have descried the marchings of the enemy at a great distance upon the plain, or the evolutions of a fleet in the waters beyond. 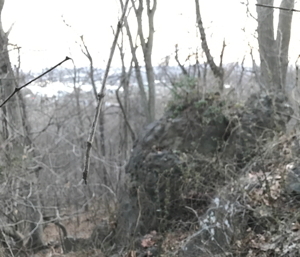 In the rear of Plainfield, at an equal elevation, and upon the same range of hills, is another rock bearing a similar appellation, and from the same cause. It is near the brow of the mountain, but, unlike the one under consideration, it stands quite alone and rises from a slope of the hill, about twenty-five feed from base to summit. From this latter lofty position, it is said, Washington watched the movements of the enemy in the summer of 1777." 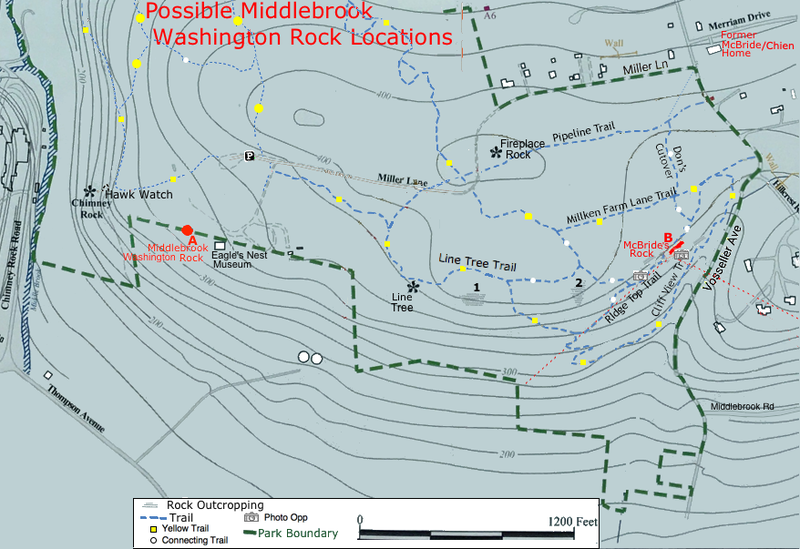 Lossing's "Washington Rock" is actually a rock located near today's Hillcrest Road in Bridgewater. 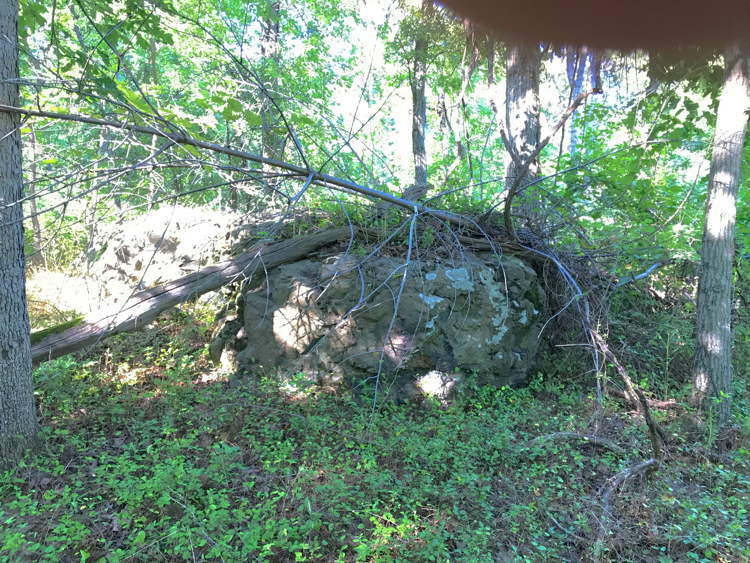 This "Rock" can be located on several early maps and would have been part of the Middlebrook Encampment. Unfortunately it was not preserved and now sports a swimming pool on top of it. 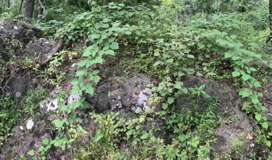 I walked for 1/2 mile along the ridge east of Vosseller and south of Hillcrest and didn't see any rock formation with a swimming pool on top of it. Middlebrook Washington Rock - Identified in "Revolutionary New Jersey"
In his book "Revolutionary New Jersey: Forgotten Towns and Crossroads of the American Revolution"
Mayers has labeled the rock at location A near Chimney Rock, Middlebrook Washington Rock and the rock at location B near Vosseller Ave. McBride's Rock. 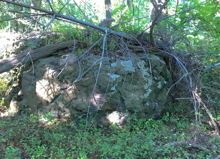 has labeled the rock near Vosseller Ave. McBride's Rock. There is no parking near location B. In the summer you can see it from Vosseller Ave. but there is no place to pull over or stop. From the top of the rock it about 1/4 mile to the trail at the bottom. Chimney Rock was ruled out. There is no view to the SE toward New Brunswick. "Revolutionary New Jersey: Forgotten Towns and Crossroads of the American Revolution" Robert Mayers 2018.